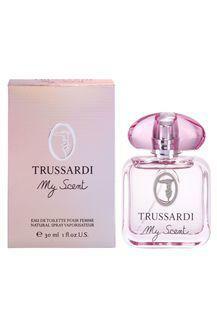 My scent from the house of Trussardi is a charming, bright and elegant bouquet of voluptuous flowers. The fragrance opens with spring flowers and fruity notes of nashi pear leading to the heart of lilac and roses. The base consists of heliotrope, cashmere and white musk with fruity undertones. This floral-fruity eau de toilette for women is an intense fragrance that lasts all day.